Writers write always. Whether it's a blog post, journal entry, a letter to mom. As long as words are being put on paper it's writing. Now, I say that if you are trying to be a fiction writer then you need to be writing fiction everyday on top of the other compositions you may do but that's me. Geek to Author is a slow go. Finding time to write is very difficult, especially with a full career, wife and 2 kids, coaching baseball, etc... but I see people do it all the time and they are writing books! Why can't I? Why can't you? I know the answer, commitment. Dedication. Failure to build a structured routine. I came across a resources, several actually, that is specifically targeted for writing with a career. The common thread is ease into the routine but build into your day that you sit down and write. Period. I am going to share these writing exercises for everyone else as well as give an insight to my methods. I haven't been blogging here much, but that's because I have been writing. Not putting anything out there for consumption yet, but I am writing. 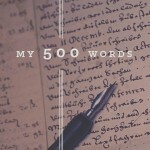 Short stories mostly but I have a very rough draft of 50,000 words toward a book. So I am doing it. The second part, editing my work, is where my analytical OCD is battling me. Tweaking the stories, expanding them, changing the dialogue instead of fixing the grammar and flows. Each exercise I do I will start to publish them here. They are not ground breaking and most of them I tweak around to make them more creative and challenging for me. You don't have to follow them verbatim but use them in your own way for your daily writing. I have found it's very liberating and frees the mind to break away from your stories and structures and freestyle write about nonsensical topics as creative and in styles you may never use again. Experiment. We only learn from failures.